"Brush Wall Plate blends in and makes it easy to neatly run cables & wires through the wall"
It's now possible to keep your home looking clean and tidy, without cables running everywhere - but still enjoy a top notch HDTV or home theatre system. With your new brush wall plate insert, you can quickly and easily run all cables through the wall without making a mess. Run HDTV cables including HDMI, coax cables, all audio/visual wires, phone, internet, or other networks cables easily through this single brush outlet cover. Whether you're setting up an HDTV or a complete home theatre system, this discreet cable access port has got you covered. This cable access strap is white/ivory to coordinate with the existing color scheme of most homes. 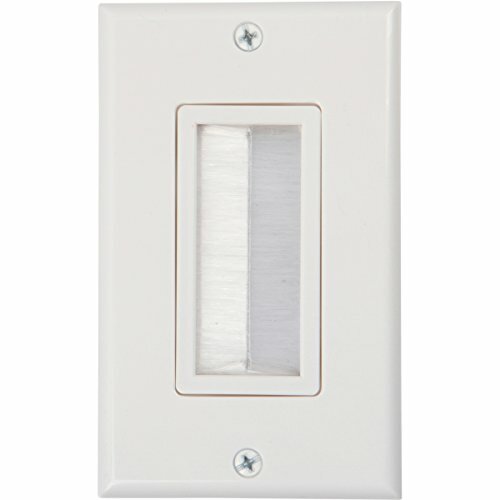 Light switch and socket plates are generally the same color, so your gang cable plate will blend in perfectly. The brush wall plate is as easy to install as any regular socket wall plate - all you need is a standard screwdriver. Simply affix the brush insert to the outer casing, screw in the four screws and you're good to go!